Tag line: "A man went looking for America. And couldn't find it anywhere.."
Easy Rider burst onto the scene in 1969, daring to speak to a new audience, a younger generation that had not yet found their voice in motion pictures. So bold and refreshing was Easy Rider that it was named "Best Film by a New Director" at that years Cannes Film Festival, where it also competed for the Palme d'Or. After completing a major drug deal in L.A. that’s netted them more money than they know what to do with, bikers Wyatt (Peter Fonda) and Billy (Dennis Hopper) head east to check out Mardi Gras in Louisiana before finally settling down in Florida to ‘retire’. On the way, the two experience a slice of America they never expected to see, spending time at a hippie commune and even landing in a small-town jail, where they meet George Hanson (Jack Nicholson), a lawyer who asks if he can tag along on their adventure. But when a violent confrontation with local rednecks ends in tragedy, Wyatt and Billy start to wonder if their “American Dream” has turned into a nightmare. 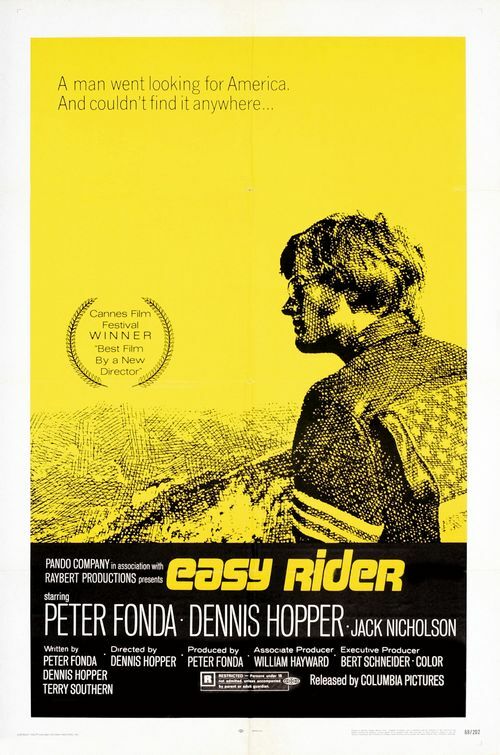 At its heart, Easy Rider is a story of freedom, of two men who set out to find America, yet ultimately lose their way. Once rich, Wyatt and Billy figure they've got it made, but out on the open road they encounter a variety of individuals who've already found peace in America, including a Rancher (Warren Finnerty) who lives off the land, and a hitchhiker (Luke Askew) who leads Wyatt and Billy to a hippie commune, where everyone's happy despite the fact they have very little. Even George Hanson, played marvelously by Jack Nicholson, seems to have it all figured out with his non-chalant approach to life. Towards the end of the film, when Wyatt says to Billy, “We blew it”, he’s saying they’ve lost out on true freedom, which they only felt was within their grasp because of the money. Without the riches, they'd have never considered themselves free, and to come into contact with so many others, who've little or no money yet have discovered true freedom, was an eye-opening experience for Wyatt. Yep, they blew it...and in a big way. With its brash new approach to film making, supported by an explosive rock soundtrack, Easy Rider single-handedly jettisoned American movies into a whole new era of creativity, paving the way for a younger generation to take up the reins in Hollywood. How ironic that Easy Rider managed to generate the very freedom for others that its main characters let slip through their fingers! The Harley Davidson motorcycles are like horses in a western I heard, and I agree the soundtrack is so explosive & cool and works so well with the biking, the iconic music is almost another character in the story. Yes, Jack Nicholsen really stood out, you can’t take your eyes off him. Look out for my review soon! @moviesandsongs365: Thanks for stopping by! Yeah, EASY RIDER is a tyrue American classic, and as good as Fonda and Hopper are, Nicholson steals the show in the few scenes he's in. Looking forward to your take on the movie!